A native of the Southern California Coastline, Chef Michael Gerbino has always had a passion for light, fresh, & flavorful faire. 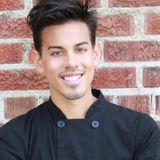 This passion led him into the hospitality world at the age of 16 with his first job at a restaurant in Newport Beach. After college, Michael took his passion for food with him into his career as a hospitality publicist, where he worked to gain media recognition to some of Los Angeles' best upcoming chefs and their restaurants. In 2012 Michael decided to swap the suit for the chef coat and began his career as a chef, graduation top of his class; Chef Michael knew he had found his true calling. Working in the private homes for Top leaders in the Entertainment Industry, as well as Celebrity Clientele, Chef Michael has a proven to be a leading force in the culinary industry, with his exceptional creative flare, health conscious menus for both in-home as well as personalized meal plan deliveries, Chef Michael caught the eye of Bravo producers and was featured on Recipe for Deception. With his recent expansion to San Francisco, Chef Michael is quickly making his mark in the Bay Area, cooking in the homes of Silicon Valley's Tech Elite while continuing to refine his craft. Chef Michael prides himself on staying current with nutritional news and culinary trends, ensuring that his clients' meals are moden and ever changing. Food Is What Brings People Together, Being Fearless In The Kitchen And Having Fun At The Same Time Is Quintessential! Experienced Chef available to provide the absolute service and experiences!